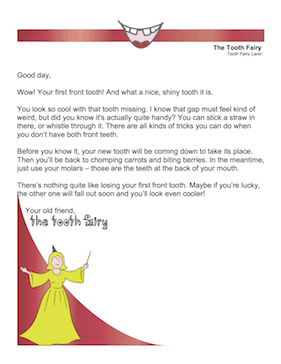 This letter from the Tooth Fairy is perfect for when your child loses his/her first front tooth. Wow! Your first front tooth! And what a nice, shiny tooth it is. You look so cool with that tooth missing. I know that gap must feel kind of weird, but did you know it's actually quite handy? You can stick a straw in there, or whistle through it. There are all kinds of tricks you can do when you don't have both front teeth. Before you know it, your new tooth will be coming down to take its place. Then you'll be back to chomping carrots and biting berries. In the meantime, just use your molars -- those are the teeth at the back of your mouth. There's nothing quite like losing your first front tooth. Maybe if you're lucky, the other one will fall out soon and you'll look even cooler!